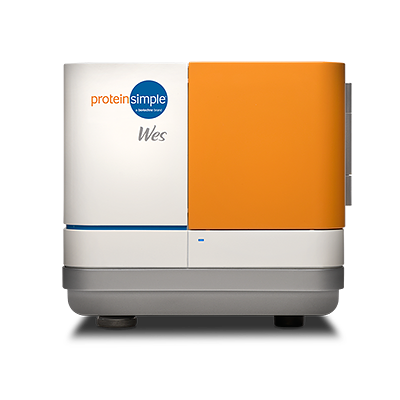 Simple Westerns™ let you separate and analyze proteins by size from 2-440 kDa either by immunoassay or total protein analysis. And there's even a charge-based assay if you're doing post-translational modification characterization. You'll get quantitative results, reproducibility that's spot on, and use less sample in the process. So what's the big difference between Simple Western and everything else? It's the only gel-free, blot-free, hands-free capillary-based immunoassay platform that integrates and automates the entire protein separation and detection process. So you'll have more time to get down to real science. Simple Western Assay: How does it work? 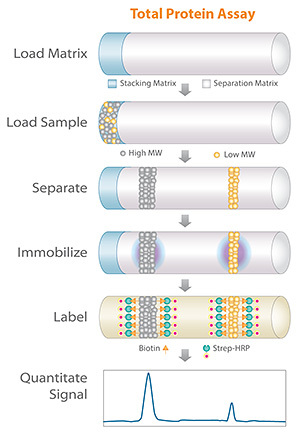 You can separate your proteins two ways with Simple Western™ assays—by size or by charge. We've got systems that'll do one or the other, or both! No matter what option you choose, you'll get the separation you need, identification of your target protein, and truly quantitative data that lets you make the most accurate experimental decisions. A Simple Western by size is an automated Western—no gels, no transfer devices, no blots, no film and no manual analysis. 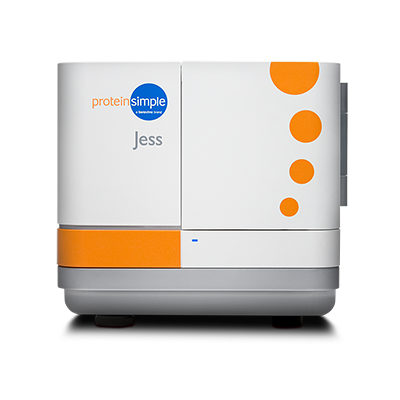 Just load your samples in Jess, Wes, Peggy Sue, or Sally Sue and press start—it's a complete, walk-away solution for protein separation and detection. Jess, Wes, Peggy Sue, and Sally Sue automate all steps automatically including sample loading, size-based protein separation, immunoprobing or total protein labeling, washing, detection and data analysis. Variability in the manual processes that used to impact reproducibility, quantitation, time to result and overall data reliability is eliminated. Transition is simple—the same antibodies used for Western blotting protocols can be used with Simple Western assays. Up to 96 samples can be processed at once, and assays take just 19 hours to complete with sizing and quantitation results. Separate and detect proteins as small as 2 kDa or as large as 440 kDa in only 3 hours. There are two ways to run Simple Western size-based assays—immunoassay or total protein. Just load your samples and off to the races you go! Simple Western immunoassays take place in a capillary. Samples and reagents are loaded into an assay plate and placed in Jess, Wes, Peggy Sue, or Sally Sue. As little as 40 nL of sample is loaded into the capillary automatically and separated by size as they migrate through a stacking and separation matrix. The separated proteins are then immobilized to the capillary wall via a proprietary, photoactivated capture chemistry. Target proteins are identified using a primary antibody and immunoprobed using an HRP-conjugated secondary antibody and chemiluminescent substrate. The resulting chemiluminescent signal is detected and quantitated. Interested in looking at all the proteins in your lysate? Just leave out the antibody and let Wes, Peggy Sue or Sally Sue do the work for you. Target proteins separated by size are labeled with a biotin reagent and is detected by chemiluminescence using Streptavidin-HRP. At the end of the run, you've got relative quantitation for your protein of interest in total protein in the sample. What Does the Data Look Like? Simple Western size-based assay data is processed automatically in Compass for you. Sample data is displayed by lane in a virtual-blot like image similar to traditional results with one big exception—not only do you get more information, you get it as soon as the assay is complete. Quantitative results such as molecular weight, signal intensity (area), % area, and signal-to-noise for each immunodetected protein are presented in the results table automatically. Just need total protein? We've got that covered too! 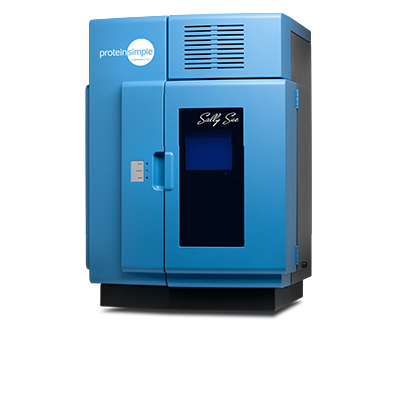 Total Protein detection. Decreasing concentrations of DNAK in Hela lysate and negative controls (15, 7.5 and 3.75 µg/mL). 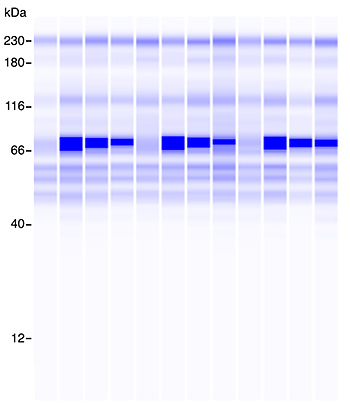 If you're more familiar with capillary electrophoresis, you can see your results in a more traditional electropherogram view too. Looking at big proteins? Try this on for size. 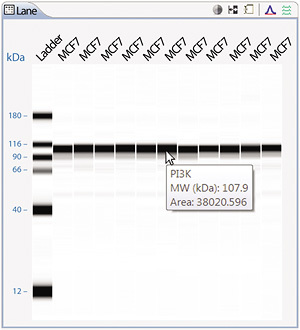 Simple Western now has a wider molecular weight range capability, so you can detect proteins as large as 440 kDa. Detection of 3 high molecular weight targets. HECTH9, Talin and UBR5 were detected in K562 lysate using the 66-440 kDa Master Kit. Simple Western assays are fully automated by Jess, Wes, Peggy Sue, or Sally Sue and easily standardized, making your results much more reproducible. And there’s no blotting step, so inconsistencies caused by protein transfer are eliminated, which really improves your quantitation too! Phosphoinositide 3-kinase (PI3K) expression in an MCF-7 lysate. Ten replicates (n=10) of MCF7 lysate at 1 µg/µL were analyzed using a PI3K-specific primary antibody. The predicted molecular weight of PI3K is 110 kDa. 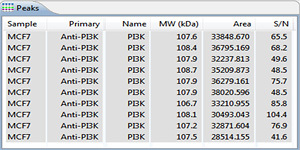 Simple Western assay data reported an average molecular weight of 107 kDa with a 0.5% CV for sizing and an 8.7% CV for signal intensity (area). Simple Western assays have a linear dynamic range of approximately 3 orders of magnitude, letting you detect proteins over a wider concentration range, not to mention with more accurate quantitation. 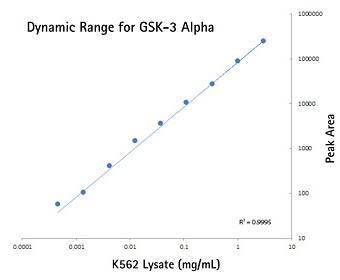 Dynamic range of detection for GSK-3 alpha. Lysate from K562 cells lysed in Bicine/CHAPs buffer was serially diluted and analyzed using a GSK-3 alpha antibody. The calculated dynamic range was 3.3 logs with an R² value of 0.9995. A Simple Western by charge is an automated assay just like a Simple Western by size—without the use of gels, transfer devices, blots, film or manual analysis, but the data you get is very different. Because proteins are separated by their pIs, you'll be able to see extremely small isoelectric point differences. It's a new way of looking at discrete changes in very small samples that you might just be surprised by! Peggy Sue and NanoPro 1000 automate all steps automatically including sample loading, charge-based protein separation, immunoprobing, detection and data analysis. Low abundance proteins in limited cell populations are a specialty, as few as 25 cells per assay are required. Up to 96 samples can be processed at once, and assays take just 19 hours to complete with reported pIs and quantitation results. You can characterize actions of kinase inhibitor drugs or study oncoprotein control mechanisms in primary tissues or fine-needle aspirates. 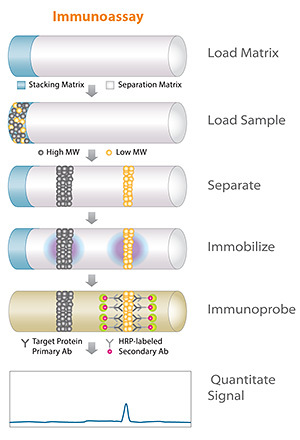 Simple Western charge-based assays take place in a capillary. Just load your samples and off to the races you go! Samples and reagents are loaded into an assay plate and placed in Peggy Sue or NanoPro 1000. Proteins and ampholytes are loaded into the capillary automatically and separated by charge and resolve according to their expected pI values. The separated proteins are then immobilized to the capillary wall via a proprietary, photoactivated capture chemistry. 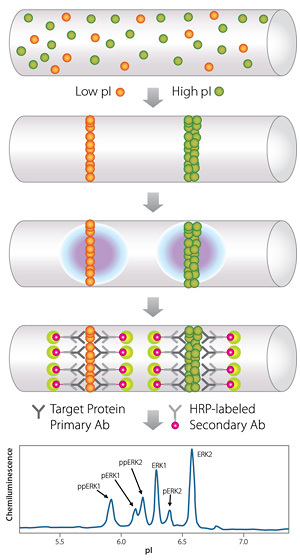 Target proteins are identified using a primary antibody and immunoprobed using an HRP-conjugated secondary antibody and chemiluminescent substrate. The resulting chemiluminescent signal is detected and quantitated. What Does the Data Look Like? Simple Western charge-based assay data is processed automatically in Compass software. Sample data is displayed by electropherogram where it's easier to see minute changes. 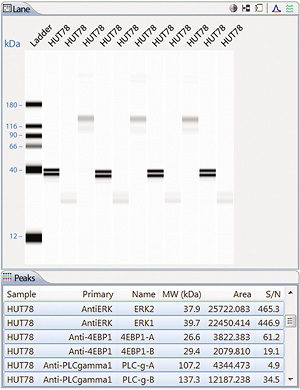 Quantitative results such as pI value, signal intensity (area), % area, and signal-to-noise for each immunodetected protein are presented in the results table automatically. * Jess/Wes with HDR detection mode.